Fall harvests yield heartier produce, and the season is the perfect time to warm things up in the kitchen, which can double as a heating device for the home. It is time to get cozy. Café at Adele’s has been serving butternut squash bisque for years. This has become a favorite, with folks calling to ask which days it will be featured. Interestingly enough, the idea for this recipe was born out of our trip to The James Beard House in New York City in 2005. The entire restaurant crew spent 10 delightful days fulfilling the dream and being honored to cook at this legendary place. 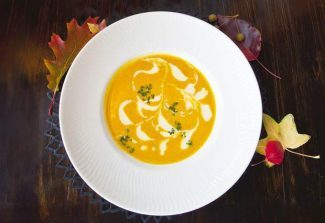 I suggest pairing the butternut squash bisque with Dunstan Winery’s chardonnay, made from grapes grown at Durell Vineyard in the Sonoma Valley. The first step in preparing this soup is to bake the squash to a soft texture. Split the squash in half lengthwise and remove the seeds. Wash thoroughly; place in a baking pan flesh-side down after rubbing the halves with some brown sugar and fresh ground pepper. No salt at this time, please. Place about half a cup of water in the pan and cover tightly with foil. Bake in a preheated, 375-degree oven for at least an hour and a half. Check for doneness. The flesh must be soft enough to scoop out of the skin. If it is not done enough, bake longer. Don’t panic; each oven and squash is different and the baking time can take as long as two and a half hours. You can bake the squash the day before preparing the soup. After you finish baking, let the squash set and cool (about one hour) enough so that you can handle them easily without burning yourself. Scoop the meat and set aside. To make the soup, place butter in a 10-quart soup pot along with onion, carrot, celery and celery root. Lightly sauté over medium-high heat. Do not scorch. Pour in the maple syrup, heavy cream, orange juice and wine. Bring to a boil and add the squash. Simmer for one hour on low heat at a lightly rolling boil. Turn off heat and let set for 20 minutes. Add the white pepper and nutmeg. Place a hand blender in the pot and blend thoroughly. This will take a minimum of 10 minutes. At the end of the process, stir with spoon to make sure everything has been blended together. Taste and let your own taste buds guide you as to whether you need to add more maple syrup, white pepper or nutmeg. You may or may not need salt. This soup is delicious topped with a dollop of yogurt that has been whisked with a touch of maple syrup and roasted pecans.